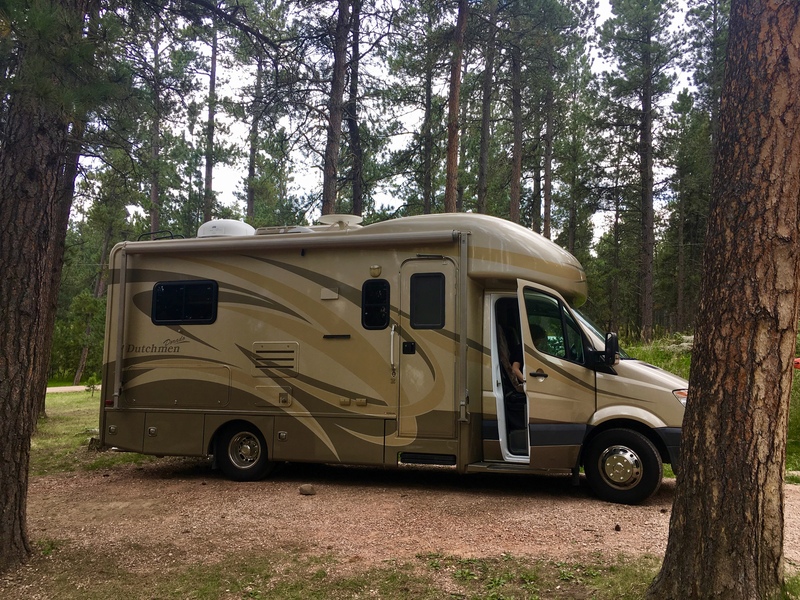 Black Hills “Secret” Hikes – RV There Yet? Welcome to the first of the Black Hills Trail series. Bob is anxious about disclosing his favorite trails but considering this one leads to a big section of the Dakota 5-0, with six hundred entries per year, it is hardly a secret. Also, I have yet to drive by Iron Creek Trail without seeing at least two or three cars in the parking area. First things first, we hiked this trail on October 7, 2017. The leaves, trees, weather were beautiful-70 degrees. If we would have hiked one or two weeks earlier more leaves would have been on the trees instead of the ground, but it was still a great hike. The Iron Creek Trail head is approximately 2 miles from Savoy up Spearfish Canyon. If you haven’t driven up the canyon in the fall, you are seriously missing out on one of the most scenic highways in South Dakota. That being said, pay attention to the road so you don’t hit me or one of my friends peddling up the 12 miles to the top of the canyon on our bikes. Back to the trail. Iron Creek Trail follows Iron Creek from Spearfish Canyon to Iron Creek Lake if you are super ambitious. It is a flat trail and suitable for a family hike with any age child. It is exactly 1.25 miles to the barbed wire fence. At this point, parents with small children should turn around and walk directly back to their awaiting car, drive to Cheyenne Crossing and order some fry bread with honey. You earned it, you just hiked 2.5 miles!!! Gold panners- There’s gold in them hills. Just for the record, there is also gold at Neugebauers Jewelry Store in Rapid City or RMS Jewelers in Spearfish and you don’t have to climb down a cliff and risk your life to get it. Did I mention I hate cliffs??? A cave- what’s in the cave you may ask? Probably gross things but you can look if you feel like crossing the creek. After crossing the barbed wire fence, the trail gets a little more difficult but offers beautiful views if you make it to the top. As I mentioned before, this part is not for young children unless you like to increase the whine factor or you are 100% Norwegian (in case you didn’t know, they are way better hikers than the average American). The following is a geocaching by picture attempt to get you to one of the prettiest views in Spearfish, although there are many. Full disclosure: I am still confused at whether the sun sets in the East or West so hike at your own risk. Also note, there is no geocaching prize at the top waiting for you other than fresh air and mountains. Right after you cross the barbed wire, turn left for 5-0 bike trail, right for random bushwacking self-guided mine tour, straight to hike to Big Hill. Maybe the only helpful marker in my picture vault. Very nice, Perry, Kristi, and crew. Now, follow the trail and feel a small amount of pity and an equal amount of envy for the 5-0 climbers who do this on their bike. Next you will come to this very nice crossroad that looks very similar to all the others. Fear not, the trail is marked and if you work for the National Forest Service you will actually know what they are trying to mark. If not, turn left. Turning right will lead you to Red Lake (not actually a lake, don’t be fooled). Did you think I posted the same picture twice? Nope this is the next turn left. Similarly marked with a numbered sign. This post might actually help you as is clearly says dead end. Walk in the direction of this sign. It is also worth noting that mountain bikers ride way faster than hikers walk…move for them or you may become one with them. Next, you will turn right and venture up the Cardiac Climb. Note the name of the trail prior to starting the hike. Follow Bob (or your own people) to the top- you won’t be disappointed but you will be out of breath. My iPhone picture doesn’t do this view justice so you will have to hike here to see it for yourself (3.5 miles). P.S. that mountain on the right is Terry Peak. You are up really high at this point. If you made it to this tree you are at exactly 4 miles, turn around, you aren’t Norwegian either. Be forewarned that there are approximately 100 other trees identical to this one. If you are officially lost from my directions, don’t worry-South Dakota doesn’t have bears. We do have mountain lions and rattlesnakes so you should eventually try to find your way back to the car. Tschetter’s Wine Bar aka Spearfish Creek Wine Bar. Home of the sunny backyard, a great cheese plate with no “brie, no marmalade, no green stuff- just good old South Dakota Dimock Cheese and buffalo salami” (Bob) and the best beer in Western South Dakota, (also according to Bob)- the Knucklehead Red. *A couple of campsites are available in the Spearfish Canyon area. Some options are Timon or Rod and Gun Both have potable water and restrooms, but only seven sites so get there early. You can also camp on the National Forest Land for a maximum of 14 days out of 60 if you are totally self-contained. Iron Creek Lake also has RV sites (electric only) with a dump station. Next Post Jack’s 94th B-day, New Baby Lainey, Sister Visit, Big Hill Trail Maintenance, and RV winterizing. Awesome Pics and introduction to these Black Hills trails.